Dhaka, Apr 25 (Just News): The International Crimes Tribunal -1 today sent former additional inspector general of police to jail in a case filed for allegedly committing crimes during the Liberation War in 1971. Police yesterday arrested Oahidul Haque, 69, from Gulshan area in the capital hours after the ICT-1 issued an arrest warrant against him in the case following a petition moved by Prosecutor Tureen Afroz. 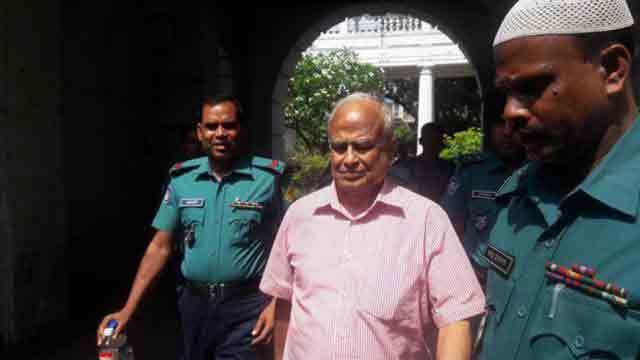 A two-member tribunal led by Justice Amir Hossain sent Oahidul Haque to jail after he was produced before the court around 11:30am today, Tureen Afroz said. The tribunal also asked the prosecution to submit report on May 10 on the progress over the investigation of the case, she added. Oahidul was allegedly involved in the killing of around 500 to 600 people near Rangpur cantonment on March 28, 1971. He is the second man who, being a Bangalee, worked for the Pakistan army and is now arrested after being faced with war crime charges. Muhamed Shahidullah from Comilla, a former Bangalee army official who allegedly worked for the Pakistan army, is facing similar charges. In her petition, Tureen said investigation against Oahidul started on December 5, 2016, and the investigation officer has already found evidence of his involvement in crimes committed in Rangpur. He was trying to influence potential witnesses of the case, which was why he needed to be arrested for proper investigation, Tureen said, adding that the tribunal allowed her prayer. According to the investigation agency and prosecution of International Crimes Tribunal-1, Oahidul, of Chandibardi village under Madaripur Sadar Upazila, joined Pakistan army in October, 1966.